Join the discussion on our forums! Come discuss The Voraxx over in our dedicated The Voraxx discussion topic. Just opened this a couple days ago, and strongly considering putting this in an Even Paladin deck to pair it with Spikeridged Steed later in the game. 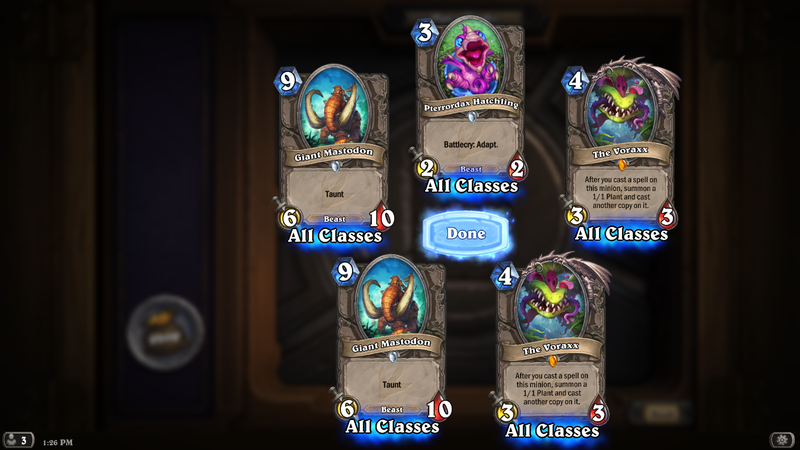 Yeah I just unpacked a golden one this morning. Now I think I HAVE to build a deck with it! The card is pretty good currently in lynessa/quest paladin. Just opened this and I feel cheated. Firstly it annoys me to think that Blizzard devs were probably forcing quest paladin when they designed this, but they already had Tarim so they forced into neutral legendaries a minion that hardly works on any class other than paladin, maybe priest but it's worse than what they already play. Besides, this card is bad on it's own. 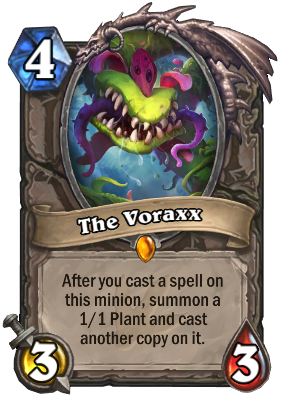 I think The Voraxx should cost 3 mana, or should have been an Epic even. It doesn't feel legendary, not at all. Will the taunt and stat increase from Defender of Argus be counted as a spell on The Voraxx? 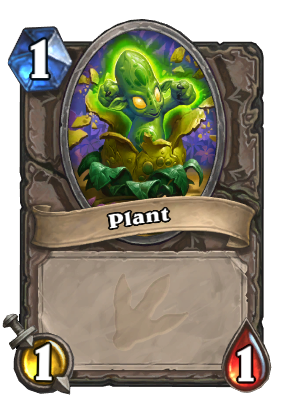 Will I get a plant 2/2 plant with taunt? No, it does not count as a spell. Why has this been downvoted? "I am the Voraxx. I speak for the weeds." "I speak for the trees. Let 'em grow! Let 'em grow!" "But nobody listens too much, don't you know"
Edit: Sqeitor's comment was downvoted to -1 when I posted my comment. what would happen if you had a damaged voraxx and you cast rampage (+3/3 on damaged minion) on it? Voraxx is just too slow to run. You can't really afford to use it outside of Blessing of Kings or Spikeridged Steed, and even then you are better off using them when they are available rather then saving them for the combo. Still good to have in it, similar to the 2 cost ooze that creates a duplicate of itself. Shut it all down, turns out you don't get double count for the Paladin quest on this thing.